The smell of corruption has been emanating from the NSW State Government for some time now, and it has been particularly strong downwind of the NSW Central Coast and Hunter regions. Recent investigations conducted by the Independent Commission Against Corruption (ICAC) into government activities has led the independent regulator to pursue corruption allegations against countless members of government’s highest offices, including charges from funding fraud and money laundering, to corruption of regulatory process; the common theme, corporate back-scratching and the systemic sell-off of the NSW environment. But, as details of the approvals for the disputed Calga quarry, T4 Newcastle coal port and Bentley gas drilling sites continue to emerge, it appears ICAC may only have scratched the surface of the corrupt dealings in NSW Government. – Former NSW Premier Barry O’Farrell announced his resignation after misleading an ICAC investigation into ‘gifts’ he received in office. – ICAC is investigating Central Coast MPs Chris Spence and Darren Webber who allegedly solicited payments in return for favours. – Tim Owen, Liberal MP for Newcastle, the home of the disputed T4 Coal Port extension, wasaccused by ICAC of receiving money “under the table” to fund his election campaign. – NSW Police Minister Mike Gallacher resigned after ICAC decided to pursue him over an alleged plot to disguise developer donations. – ICAC made money laundering allegations against Former NSW Energy Minister Chris Hartcher, who (along with Gallacher) allegedly funnelled cash through two Liberal Party slush funds over a 3 year period. – Tim Koelma, the former Hartcher political staffer was accused by ICAC of “lying through his teeth”to the ICAC enquiry. – Parliamentary Secretary to the Premier, Marie Ficarra was accused of soliciting a donation from a banned donor, and stood down. – It is even possible the Prime Minister may be implicated, as ICAC investigators reportedly “inch closer to the Prime Minster’s office”. The new NSW Energy Minister, Anthony Roberts, suspended coal seam gas (fracking) company Metgasco’s drilling rights, halting operations at the disputed Bentley site in the state’s north. Mr Roberts says ICAC discovered links between Metgasco and former Labor powerbroker Eddie Obeid, while community consultation on the project was effectively bypassed. The matter has now beenreferred to the ICAC corruption commission. But while the Northern Rivers community celebrates, elsewhere, members of the Central Coast and Hunter communities say the approval processes for the disputed quarry extension at Calga and T4 Coal Port extension at Newcastle showed similar disregard for community consultation. Notably, Tony Kelly, the Labor MP who now faces prosecution after ICAC found that he engaged in corrupt activities, was the Planning Minister when the mining company Rocla Materials first applied for the new quarry at Calga. In late December 2013, mining company Rocla Materials Pty Ltd was granted the permission of the NSW State Government to extend its quarrying operation, a proposal that would see the company remove a million tonnes of high sandstone aquifer rock from the waterways at Calga each year for the next 24 years. But according to a January 2014 Daily Telegraph report, Ian Sutton, the President of sustainability project Equilibrium Future Solutions said the impacts on the area’s already-struggling water table cause irreversible environmental damage and put pressure on the region’s hanging swamps, natural waterways, and over 30 endangered species that rely on them. (Read more here). The disputed area also includes several sacred Aboriginal sites, including a rare and significant women’s site, all part of the ancient Aboriginal Dreaming Track. Its destruction by Rocla would destroy with it tens of thousands of years of Aboriginal heritage, in yet another affront to the ancient indigenous culture of Australia. Chairwoman of the Guringai Tribal Link Aboriginal Corporation, Tracey Howie, said land bordering the mine is ”one of the most culturally sensitive and significant areas in the Sydney Basin”. Despite the extreme damage it is predicted to cause to the region’s waterways, endangered species and ancient sacred Aboriginal places, the NSW State Government granted its approval to Rocla to extend its quarrying operation by around 300%. Although Rocla Materials development manager John Gardiner said the concerns of residents and the Aboriginal community “has been looked at thoroughly by competent people”, Gosford City Deputy Mayor Bob Ward disagrees. “The report didn’t fully address… the protection of Aboriginal culture and heritage… the effect on endangered ecological communities, the damage to the water aquifers, the disastrous impact on the nearby Australia Wildlife Walkabout Park and the problems associated with dust and silica settling on water storage”. Since December, the NSW State Government has faced mounting community opposition, the advice of local Aboriginal custodians, warnings from environmental experts, and concerns raised by local government representatives about the consultation and approval process. And yet, inexplicably, the NSW State Government remains fixed on this matter. Community members are left wondering: are NSW State Government priorities being determined with Rocla Materials, not the community, in mind? While ICAC are yet to investigate this questionable development approval, full details have now been forwarded to representatives at ICAC. There are also currently two court appeals being prepared in response to this development, by the Darkinjung Land Council and the nearby Walkabout Wildlife Park. Of the two complainants, the Walkabout Park has been the most active in its opposition of the mining development. The park hosts many important endangered species breeding and education programs, as well as Aboriginal cultural programs, and since it shares borders with the proposed mining site, it is directly threatened by Rocla’s proposal. I suppose we were a bit naive but we went into this trusting the integrity of the approval process. We worked extremely long hours preparing reports to the Minister about why this site is so important, many 18 hour days, reading through the thousands of pages of documentation to make sure we left nothing out. So far we’ve spent around $400K on legal bills trying to stop this development, money that we should have spent on a new eco-cultural centre. While there are significant community concerns about the legitimacy of planning approvals in NSW, questions are also being asked of Glenworth Valley Outdoor Adventures, the 3,000 acre park that borders the proposed new quarry. According to Barton Lawler from Glenworth Valley, the park owners have actively opposed further development of the disputed quarry site for over 25 years. “In one year alone we spent over $300,000 fighting it. We have taken Rocla to court and attempted to purchase the RTA land so Rocla could not get their hands on it” he says. But while Glenworth Valley has long opposed the new quarry, it recently reached an agreement with Rocla to facilitate the mining project, providing the environmental offsets required of the government’s consent conditions. 1) The definition of offsetting is inherently flawed. Offsetting land that was going to be conserved anyway, as justification for a quarry for example, still results in a net loss to the environment. Unless the offset land was previously developed and now restored, the result is a net loss of biodiversity. 2) Biodiversity offsets must be in the form of like-for-like land that meets the legislative requirements of “maintain” or “improve”. The offset land should include similar vegetation and be in the same or better condition (although a larger quantity of land can sometimes be accepted instead). In the case of the Calga mine, environmental experts say the quarry extension will reduce the integrity of the offset land and the waterways that support it; it is adjacent to the proposed mine site and is fed by the stream that would be removed by the mining company in its expanded operation. The development of this massive expansion of Rocla’s Calga sand mine will have huge impacts on the Central Coast’s already severely degraded water systems. Their source of sand is in fact our high sandstone aquifers… [which] allow surface water to infiltrate easily and remain stored within the high ground of the landscape… It is from these ridge top reservoirs does water trickle feed the rest of the environment allowing the landscape to remain moist even during extended dry periods. Environmental activist and local political figure, Jake Cassar, says “It’s like cutting off the circulation to the top of your leg and wondering why the whole leg dies. 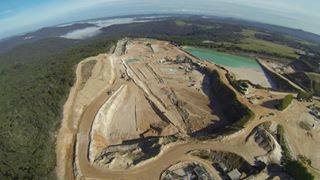 This quarry will gut the most important part of Calga… the main artery if you like”. Seeing the corruption list near the top of the article is like Just another day at the office for these guys…… problem is whose looking…… one word Apathy.